Six hours and 49 minutes. I'll be honest, I didn't start watching until the 10th inning. The (playoff-bound?) Celtics in Cleveland were my priority. Yet somehow I still managed to see an entire nine-inning baseball game. Turning it off in extra innings is something I will not do on general principle, regardless of how late it is. The first batter I saw was Xander Bogaerts, who walked in the 10th inning. 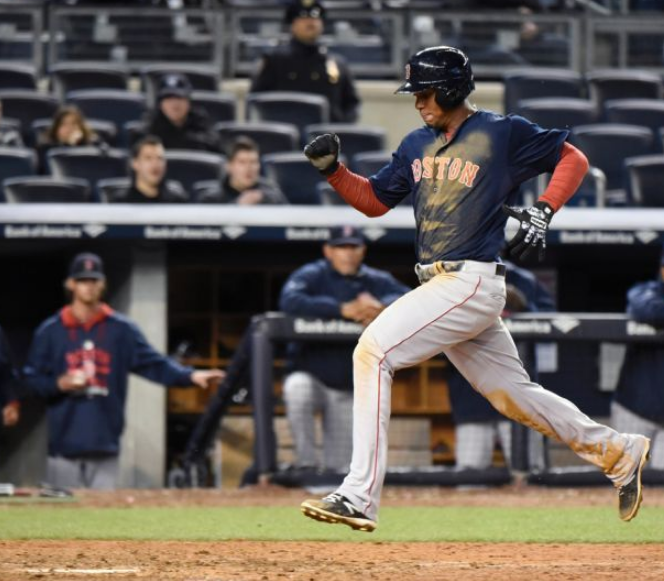 It was a disappointing evening for Bogaerts, who at the time was 0-4 with a strikeout--until he got hits in the 13th, 15th, 17th and 19th innings, then eventually scored the winning run (pictured). Bogaerts getting on base 5 times in extra innings is freaking amazing. I'm without a doubt certain that I have never before witnessed a team score in three different extra innings. Who knows if anybody ever has? @TimBritton "Nice start to the year for Wright, who scattered 9 base runners and 2 blown saves in 5IP to pick up his first win of the year"
I stopped watching when the lights went out behind home plate. Guess I missed some interesting baseball.